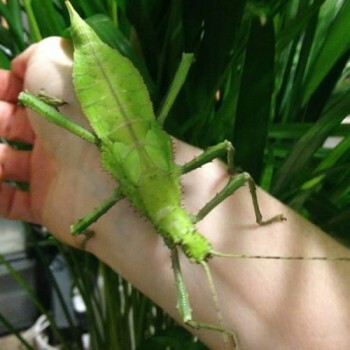 The jungle nypmhs are the heaviest of all the stick insects. The female are the most impressive as once fully grown they become a bright green colour and have a nifty trick of doing hand stands. They come from the rain forests of Malaysia and eat vegetation. We hire out the young nymphs as they don’t have the fully grown spurs which when adult can prove to be a bit spikey. They are very good at playing dead, a defence mechanism to put off potential predators. So don’t be alarmed of they do this to you as just them doing their thang.